02 Nov 2018 --- Blockchain technology has the potential to revolutionize the food supply chain as manufacturers are forced to respond to consumer pressure around transparency of sourcing and the supply chain in general. 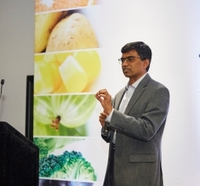 This is according to Ramesh Gopinath, Vice President at Blockchain Solutions at IBM, who spoke to FoodIngedientsFirst at the Future Food Tech Summit in London last month. He discussed the launch of the IBM Food Trust platform, which is now commercially available. A number of retailers, logistics firms and growers are working with IBM-developed blockchain technology – the IBM Food Trust blockchain network – adopting the game-changing technology to improve traceability of certain food products in the food supply chain. The blockchain-based cloud network offers businesses and food industry providers with data from across the food ecosystem to enable greater traceability, transparency and efficiency. Last month, FoodIngredientsFirst reported that Europe’s largest retailer, Carrefour, is adopting blockchain which will quickly help trace food back to its source within seconds, unlike traditional transactions, with plans to expand to all Carrefour brands by 2022. The network is now generally available after 18 months in testing, during which retailers and suppliers have tracked millions of individual food products. The move by Carrefour comes just a couple of weeks after Walmart, an early proponent of blockchain technology, announced that its leafy green suppliers would be required to capture digital, end-to-end traceability event information using IBM Food Trust. The new by these major retailers indicates that their suppliers will have little choice but to go on the blockchain bandwagon in the medium term before it becomes a prerequisite. “The IBM Food Trust product itself is a platform for trusted permissioned information sharing in the food ecosystem. It is exciting for us because of so many of the issues we see in the food ecosystem today, including food fraud, food safety and food waste. Food waste is an important topic as a lot more organic food is produced than what is consumed for example,” says Gopinath. Blockchain is very popular and topical in the food industry, but the technology itself is seen as elusive, according to Gopinath. “There is a lot of hype around it,” he accepts. “The way in which I would describe it is if you look at blockchain and its applications in this specific instance, IBM Food Trust, the problem you are trying to solve is trusted information sharing. If you have a farmer or a grower, for example, the way they should be looking at this is an information sharing platform. The questions they should be thinking about are – ‘how do I upload my information and share it with others?’ ‘How do I set permission so that only the people who are allowed to see get to see the information?’ ‘Is the data safe and secure?’” he muses. Those are the questions that companies should be considering, says Gopinath. “They should also be thinking about the mechanics of it and ensuring that all the appreciate information can be viewed and shared when relevant, engaging through the system and solving food supply issues,” he notes. “Consumers are the driving force today regarding trust and transparency,” claims Gopinath. “We expect third parties small and big companies to also deliver value on top of this platform, so that is how we share and utilize this platform to deliver value to others,” he concludes. You can view the full video interview with Gopinath here.